Don’t believe the rumors – virtual reality studios are growing in number across the world. The industry is alive and well! For some time now, various media channels have been singing the death song for virtual reality. More or less informed commentators say either that the hardware is too expensive, or that the available content is not enough varied and adapted to all tastes. But is this really the true state of things? Looking at statistics concerning virtual reality studios, it is anything but. VR is nowhere close to its demise when more and more businesses open and thrive across the world. According to VirtualRealityMarketing.com, the largest online registry of 360/VR/AR studios, there is an explosion of virtual reality studios all over the world. In 2015, the registry managed to add barely 99 studios in its online catalog. Currently, it features over 1,700 virtual reality studios. The co-founder of VirtualRealityMarketing.com, Rick Berglin, estimates that 1.5 VR studios open every day across the globe. Some of these may not thrive, but the general trend is towards a busy industry with lots of VR projects coming in every day. In the end, it’s not about the VR industry but rather all about what VR and AR can do for everyone else. Another trend is that for existing game and video production companies to add VR/360 capabilities to their skills. This is a proof that immersive technologies are taking over and slowly replacing standard 2D games and movies. 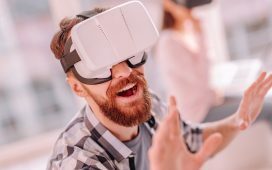 While virtual reality is used for everything from personal entertainment to advanced product design, one industry stands out as the main supporter of the technology: marketing. This industry needs to reinvent itself constantly. Consumers use ad blockers and anti-tracking filters to evade online advertising. Therefore, traditional, offline ads fail to draw attention. This is where virtual reality studios step in. They are ready to create immersive and high quality content for the marketing industry. This content fits seamlessly into the VR experiences consumers enjoy. It is also less disruptive and adds a gamification layer to the overall consumption of promotional content. While the software and content creation side is ready, the hardware industry is lagging behind. Virtual reality studios need mass adoption of VR in order to deploy their content. And mass adoption is still not here, because headsets are still heavy, bulky and expensive. “The one thing missing at the moment is, as we all know, mass adoption on the user side. Once we have comfortable, good quality headsets at affordable prices, we will see an explosion of quality VR content from brands all over the world,” says Berglin. But, just as the content becomes more varied and sophisticated, VR hardware will eventually become more affordable and easier to use. As long as top players in all industries demand VR content, they will also influence the hardware makers to step up and facilitate a greater adoption rate of the technology. The most crowded city in terms of virtual reality studios is London, with 139 units. It’s followed by Los Angeles – 124, and New York – 101 studios. In the end, the only conclusion is that, as an emerging technology, VR still needs some time before it goes mainstream. Instead of looking out for its demise, we should look ahead with optimism. And imagine all the possibilities virtual reality will offer us in the near future.